LONG BEACH— Rumor is the Braves are looking at Griffey Jr as the left fielder. The word is Griffey would platoon with Matt Diaz. This doesn’t sound too bad to me. Diaz I like. He’s a solid player who suffered through a terrible injury last year as a result of sliding very hard into a wall. Prior to that Diaz had put up an over .300 average with solid on base and slugging percentages. He thrives in a platoon but the data suggest he could manage as a full time starter. Griffey is the concern. He would platoon with Diaz and this might be out of necessity. He’s The Kid. He could kill when he was younger. He seemed like a sure fire bet for 800 home runs when he was fresh. Anything was possible with him. His swing was picture perfect. His fielding was a work of art. He was what you always hope that next young prospect will be. Then he got hit with injuries. Everything came to a halt. And this is where my concern comes in. I guess I don’t mind having a possible crutch in left field. It’s always better than the crutches occupying the starting rotation. Last year the Braves stunk. This was mainly rooted in the fact that, of the five pitchers in the starting rotation, four of them suffered injuries. Three of those injuries were season ending, maybe even career ending depending on the rehab results. The Braves have Casey Kotchman, he’s left handed. They have Brian McCann, he’s left handed. They have Kelly Johnson, he’s left handed. Now they have Griffey Jr, who’s left handed. Lot’s of lefties on this team. Hopefully that doesn’t become an issue. In the mean time; GO BRAVES! I like this! 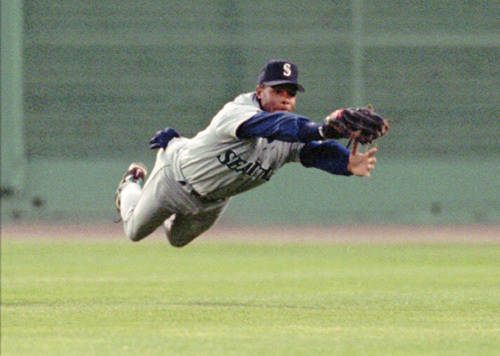 I think having Griffey’s veteran presence could be good for young up and comers on the team. We need to be thinking of this as a rebuilding year anyway, in my mind. I just don’t envision this team making the playoffs. Towards that end, having some veteran superstars on loan for a year or so to help build up the young talent could be super beneficial. And this move would be similar to Ken Griffey Sr.- after all, didn’t he spend some of his final years with Braves?